Omakase is something of an anomaly in a dining culture that thrives on fleeting trends and rapid-fire openings. It’s neither novel nor cyclical. Instead, omakase is grounded in meticulous attention to detail, the pursuit of perfecting centuries-old techniques, and presenting the best ingredients possible in clean, elegant ways. It is an intimate conversation between chef and diner. 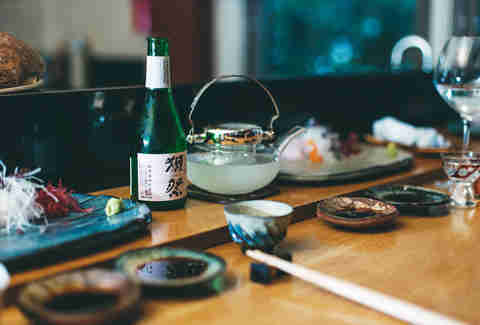 Omakase, however, is often misappropriated by dining culture here, equated to something synonymous with a chef’s tasting menu. But this tradition is far more intricate than that. With dozens of restaurants in the DC area including omakase in their offerings, we wanted to clarify some misconceptions with the help of the best sushi chef in town. 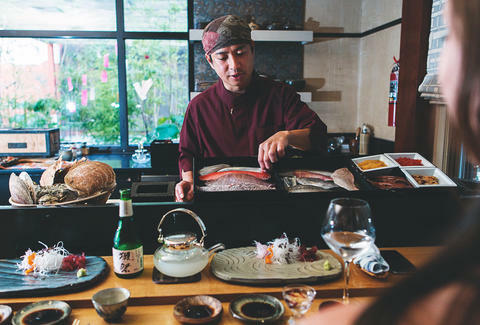 "Omakase means you see the chef’s skill," explains Sushi Taro chef de cuisine Masa Kitayama. "In Japan, many people are regulars at neighborhood restaurants. They trust the chef. These are the people who don’t want to choose from the menu." Literally translated, the Japanese characters in omakase come from the verb "to entrust." In a culture where diners regularly return on a daily or weekly basis to the same restaurant, chefs can draw upon their experiences with their customers to individually tailor meals, suiting different preferences and palates. Formal omakase dining is a discrete distillation of this experience. "Many restaurants say that they do omakase," says co-owner and general manager Jin Yamazaki. "But they’re just doing a tasting menu. It’s a series of courses that are already set. They just serve it close to the chef who explains each course, but it’s not very different from what you can get at the table." At a real omakase, like Sushi Taro’s omakase counter, the meal begins with two or three light dishes featuring a variety of flavors and ingredients. Through conversation with the chef and his or her ability to interpret tastes and palates, responses to these early courses will determine the trajectory of the rest of the seating. Another misconception about omakase is that it’s a sushi-only experience. 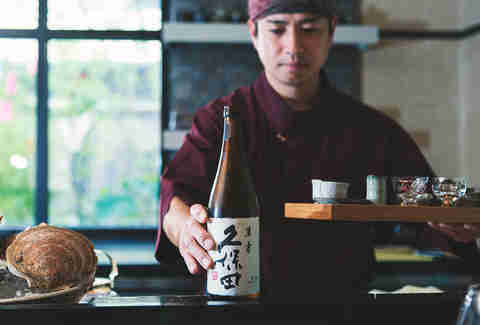 Omakase can be and often is employed in restaurants serving other types of cuisine. It is rare, however, to find an omakase counter that serves both sushi and other Japanese cuisine, even in Japan. "In Japan, Japanese cuisine restaurants never serve sushi," says Kitayama. "They’ll serve small dishes, soup, sashimi, and rice -- that’s Japanese cuisine -- but totally different from sushi. In Japan, if you go to a sushi restaurant and order small dishes, they won’t have it. So chefs have to decide: sushi or Japanese cuisine." Because Japanese chefs often spend a lifetime perfecting a single craft, this mix of skills is uncommon. Even chefs as renowned the protégé of Jiro Ono (of Jiro Dreams of Sushi fame), Daisuke Nakazawa, who owns and operates New York's Sushi Nakazawa, will not cross over. "He told me he doesn’t want to serve sashimi," Kitayama recalls. "It’s impossible. They have a lot of fish, but they don’t want to serve sashimi because they are a sushi restaurant." 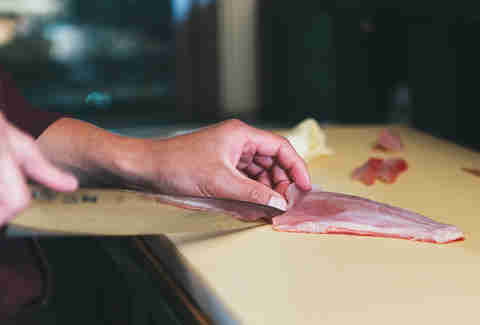 Kitayama, however, has trained in both sushi and Japanese cuisine. He began his training in Japanese cuisine in Osaka, but continued on to train in sushi in Tokoshima before coming to the United States. His experience allows him to incorporate more variety at Sushi Taro’s omakase counter. 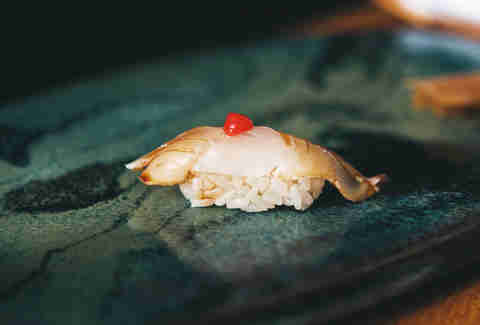 "Most sushi places, you eat just sushi, there’s no other dish," Yamazaki says. "Here we do both because we have the talent." When discussing the relevance or popularity of omakase in the United States, it is important to note that omakase has only been possible in the relatively recent past. "Twenty years ago, we couldn’t get all of these ingredients here fresh," explains Yamazaki. "That’s why we don’t have many good chefs from Japan here," Kitayama interjects. "Many Japanese chefs came to New York or DC, but became disappointed and returned to Japan because they couldn’t make high-quality sushi. They had to use inferior-quality fish." With the advancements in trade routes and cold storage infrastructure, restaurants like Sushi Taro have been able to get the ingredients from Japan they require (of which the best are reserved for the omakase counter). About half of Sushi Taro’s fish comes from Japan -- from the Tsukiji Fish Market in Tokyo, as well as markets in Kyushu. The importance of the quality of ingredients is made clear when one understands that omakase is about the expert presentation of varied ingredients, and not primarily about a chef’s creativity or imagination. "Less process is the better taste," Yamazaki states matter-of-factly. "This isn’t Western-style cuisine, where a chef might deconstruct corn and create a corn flavor using this or that. That’s not about the food. I understand the technique and the appeal, but omakase is about presenting the ingredients. It’s food." Considering the fact that a typical omakase seating at Sushi Taro can last upwards of three hours, it falls to the chef to create enough variety to maintain a diner’s interest. Yamazaki explains, "A good sushi chef can make a compelling, full-course meal with just sushi ingredients by employing a variety of simple techniques: grilling, searing, or wrapping in seaweed, which can create different textures and temperatures." Though each diner at Sushi Taro’s six-seat omakase counter will have a different experience, each meal will follow a similar rhythm. The first few dishes will be amuse-bouches, which incorporate a variety of flavors and ingredients, such as a conger eel soup, corn stuffed with crab cake, and seasoned fava beans. At this point, chef Kitayama will present the sashimi course, and be able to select fish appropriate to the diner’s palate. On any given day, the fish available may include kisu (Japanese whiting), sayori (needle fish), kenmedai (snapper), sawara (Japanese mackerel), octopus, tuna of varying levels of fattiness, and live scallops. The sashimi course is accompanied by a plate of Japanese radishes, shiso leaves, pickled seaweed, and two types of soy sauce, one with grated ginger and one house blend for wasabi. Following the sashimi, Kitayama may present another series of small plates. A recurring customer favorite is a Virginia crab dish prepared simply with soy sauce and sake, served warm in its own shell. "This dish represents Sushi Taro’s approach," says Yamazaki. "If someone else made it, I can see them using cheese on it or truffle to try to enhance, but then you lose the crab itself." Another dish that further demonstrates chef Kitayama’s unique level of skill in DC is his house-made soba -- a traditional Japanese buckwheat noodle that is notoriously labor-intensive to make -- served with okra and grilled ayu (sweet fish). "No one else in DC makes their soba by hand," claims Kitayama. "No one else can make it. It’s almost impossible." A flashier dish is Kitayama’s A-5 wagyu beef (the highest grade possible of beef from Kumamoto prefecture) with uni. 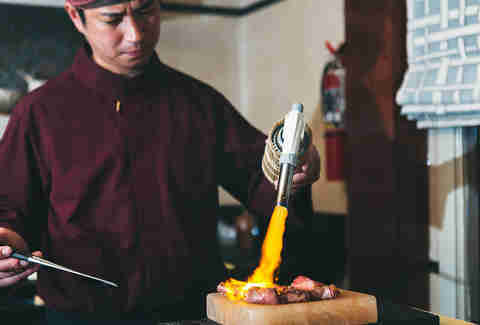 Kitayama torches the wagyu to a surface sear with a hand blowtorch, which amazes diners. 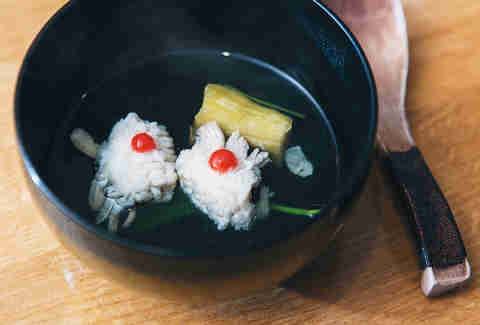 Yamazaki remarks that, paradoxically, "this is the easiest dish to make; there is no talent or technique required, but probably 99 people out of 100 will request another." Finally, the last act of Sushi Taro’s omakase seating is sushi. Similar to the sashimi course, Kitayama will present the same selection of that day’s fish and direct the diner toward palate-appropriate items. He will then proceed with the mesmerizing process of expertly molding oblong mounds of California rice (Japanese sushi rice is difficult to export and not significantly superior) and marrying it with the selected fish, before depositing a perfectly composed nigiri on the plate. The final component of Sushi Taro’s omakase that is in line with Japanese tradition, but at times uncomfortable to Western diners: prices are not set. Items are market-priced, and the final bill is determined by how the meal has played out between you and Kitayama, which can vary in the number of courses served and value of ingredients. This is the leap of faith that is involved when entrusting yourself to the hands of the chef. While Sushi Taro is arguably the best sushi restaurant in DC, and offers a real and legitimate omakase counter that would not be out of place in Tokyo, there are other spaces offering similar experiences. While Izakaya Seki does not regularly offer omakase, it prepares thoroughly authentic and faithful Japanese cooking, and can tailor an omakase meal if requested ahead of time. Kaz Sushi Bistro, Sushiko, and SEI all offer notable sushi omakase options at their respective sushi bars. Omakase is not a cheap dinner by any means, but it offers rewards for those seeking to experience one of the purest forms of Japanese cooking. Head to Sushi Taro, or one of the other aforementioned quality DC sushi shops, with an open mind and palate (and wallet, for that matter) to experience it for yourself. Brian Oh is a DC-based international development professional, freelance photographer, and writer that dedicates every spare minute not saving the world to stuffing his face. Follow him on Instagram.